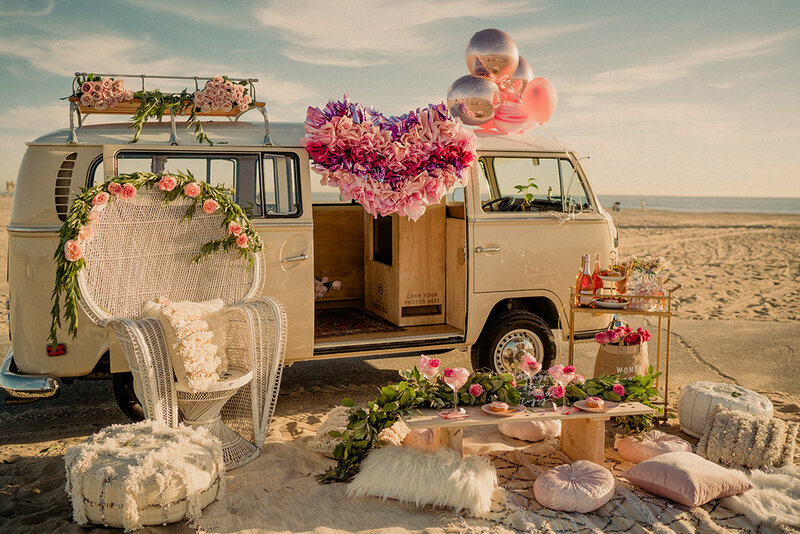 A PHOTO BOOTH INSIDE A 1971 VW BUS! Rent the Traveling Photo Bus for your next event. A truly magical & unique experience with plenty of nostalgic charm to make your event one of a kind. Born in 1971 and raised in Southern California, Mabel is an adventure-seeking, sun-loving, timeless beauty. As a social butterfly and a bus about town, Mabel loves any social event. Weddings, Parties, Corporate Events, Fundraisers - she'd be happy to cruise on by for some birthday cake or a cocktail! We understand the importance of quality photos. Our DSLR camera captures professional images, while our high-end printer allows for sharp prints instantly. With amazing photos and ever-evolving unique props, backgrounds, and décor - the photo booth is sure to be the life of the party. Take pictures inside as well as outside. Use the Traveling Photo Bus as a prop, background, or focal point. We'll happily team up with with your florist, photographer, designer, or event coordinator to give it that extra special touch. The bus can also be rented without the photo booth for photo-shoots and videos.